A Boeing 737-200 passenger jet, operated by Sky Airline, sustained substantial damage to the right hand wing in a landing accident at La Serena-La Florida Airport (LSC), Chile. There were no injuries. Sky Airline flight SKU-101 departed Antofagasta (ANF) at 15:35 on a domestic flight to La Serena (LSC). The visibility at La Serena was deteriorating but was still reported to be about 6000 m at the time of the approach. At 16:57 the flight crew contacted the controller at La Serena, reporting 31 nautical miles North of the Serena VOR. They were cleared to carry out a visual approach with a right hand base leg to runway 30. At 17:05 Flight 101 reported to be at 5.4 nautical miles from the Serena VOR. The controller cleared the flight to land on runway 30. Instead of flying a base leg, the pilot flying made a diagonal approach to runway 30. During final approach, the aircraft was never aligned with the (extended) centreline of the runway. Over the runway the airplane banked right. The right hand wing tip contacted the runway. The pilot aborted the landing and executed a go around. It appeared that the right hand wing tip was deflected upwards and had sustained substantial damage. There was also some damage to a flap fairing. 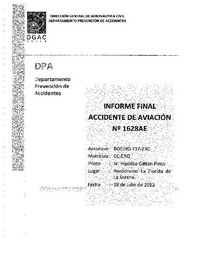 The crew decided to diverted to Copiapó-Chamonate Airport (CPO) where a safe landing was made at 17:47. La causa del accidente fue realizar una aproximación no estabilizada a la pista 30 del aeródromo La Florida, de la ciudad de La Serena, lo que originó que la aeronave impactara la pista con el ala derecha. 1 Efectuar la aproximación sin cumplir con los procedimientos establecidos para una aproximación visual indicados en los manuales Airplane Flight Manual (AFM) y Flight Crew Training Manual (FCTM). parámetros para una aproximación estabilizada. Distance from Antofagasta-Cerro Moreno Airport to La Serena-La Florida Airport as the crow flies is 721 km (451 miles).